(Phys.org)—Scientists have built tiny logic machines out of single atoms that operate completely differently than conventional logic devices do. Instead of relying on the binary switching paradigm like that used by transistors in today's computers, the new nanoscale logic machines physically simulate the problems and take advantage of the inherent randomness that governs the behavior of physical systems at the nanoscale—randomness that is usually considered a drawback. The team of researchers, Barbara Fresch et al., from universities in Belgium, Italy, Australia, Israel, and the US, have published a paper on the new nanoscale logic machines in a recent issue of Nano Letters. "Our approach shows the possibility of a new class of tiny analog computers that can solve computationally difficult problems by simple statistical algorithms running in nanoscale solid-state physical devices," coauthor Francoise Remacle at the University of Liege told Phys.org. The new nanologic machines consist of individual phosphorous atoms that are precisely positioned and embedded in a silicon crystal at a density of about 200 billion atoms per square centimeter. Single electrons randomly move in and out of the atoms due to quantum tunneling. Since each atom can hold one or two of these electrons, and each electron can occupy a few different energy levels, each atom can occupy one of four possible states. Each atom is constantly transitioning between its four states according to a certain set of probabilities, corresponding to the random movement of electrons tunneling in and out of the atom and changing their energy levels. The researchers recognized that this physical picture can be used to simulate certain computational problems. 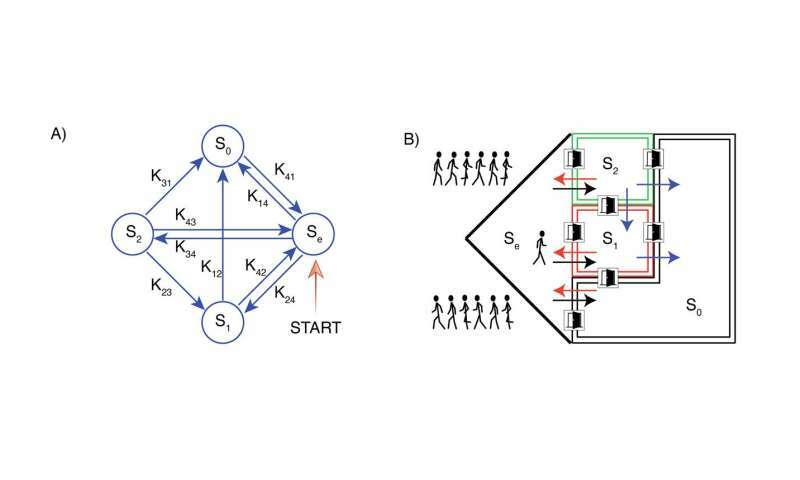 As a proof-of-concept, they looked at a relatively simple example involving the flow of visitors in a maze consisting of four rooms connected by gates. The task is to find the optimal combination of rates for opening the gates in order to maximize the time that visitors spend in one particular room. Solving this type of problem using conventional computing requires a significant amount of effort, since it typically involves analyzing the dynamics of visitors in the maze to gather information before attempting to optimize the rates of the gate openings. However, using the new logic devices, it's possible to find the solution more directly because the problem is physically embodied by the atomic "hardware" itself. For this particular problem, the topology of the maze corresponds to an atom's states, and the movement of visitors corresponds to the tunneling of the electrons. Using scanning tunneling spectroscopy, the researchers could measure the electron tunneling rates, and could also control these rates by controlling the voltage to the tip of the microscope along with the distance between the tip and the substrate. So the maze problem becomes a problem of finding the combination of voltages and tip distances that maximize the time an atom occupies a certain state. Due to the variability of single-electron dynamics, each atom has slightly different electron transport properties, which means some atoms have better optimal values than others. If the atoms were used as switching devices, like transistors, then this variability would be considered a drawback because it could introduce error. But here the variability becomes an advantage because it allows billions of logic devices to be compared against each other to determine which electron transport properties help keep the atom in a certain state for the longest time. The researchers expect that the results will lead to nanoscale logic devices capable of solving a wide variety of problems of increasing complexity—all by directly simulating the problems rather than reframing them as binary processes. "Nanoscale and molecular devices used as hardware for logic have potentially many advantages, from high packing density and low-power dissipation to the high number of states that can be used to encode information," Remacle said. "However, their dynamics is ruled by probabilistic law because of the fundamental stochastic nature of thermally activated and quantum processes. The most straightforward application is then to use nanoscale devices for the implementation of probabilistic algorithms that require significant overhead in conventional deterministic hardware. For example, the mere sampling a pseudo-random number from a probability distribution requires hundreds of instructions on a modern computer while electron tunneling at truly random times is a natural process." In the future, the researchers plan to design other types of nanologic devices, whose implementation will require positioning the components with extreme precision. "On the theoretical side, we will continue to develop different information processing paradigms tailored on the physics of nanoscale and molecular systems, with special attention to potentialities emerging from their quantum nature," Remacle said. "This is a fundamental effort for turning into useful technologies the increased ability to control and manipulate the matter at the nanoscale. Experimentally, the biggest challenge is to achieve full control of the position of dopant atoms in the silicon matrix with atomic precision and the design of their transport characteristics." How about continuous standing wave.